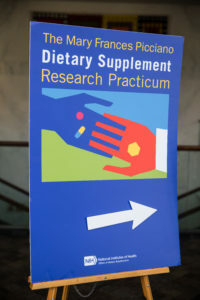 The Office of Dietary Supplements (ODS) at the National Institutes of Health (NIH) is now accepting applications for the Mary Frances Picciano Dietary Supplement Research Practicum to be held on May 29-31, 2019, on the NIH campus in Bethesda, MD. We hope that you will share this information with your organization’s listserv and colleagues who might be interested in applying to attend—especially faculty, students, and practitioners with a serious interest in the subject. Approximately 100 individuals will be selected to participate. The deadline to apply is Thursday, February 28, 2019, at 11:59 p.m. (Eastern Standard Time).